Varsity goes the distance tonight 4-1 against Warren Central. JV earns a 5-0 win in clean fashion losing just two games across five courts! Crawfordsville Invitational is CANCELLED tomorrow 4/20. No make-up. Home games are played at Broad Ripple Park, unless otherwise noted. The Trojans only dropped one game across all five courts. Winning 6-0, 6-0 were Zach Lewis (11), Jacob Zurawski (11), & Sam Annakin (12). #1d Jack Phelps (12) & Adam Pemberton (12) were also victorious 6-0, 6-0. Elias McQueary (12) & Jack Calvert (12) won 6-0, 6-1 at #2d. Sam Annakin takes home a three set victory at #3s 4-6, 6-4, 10-5, while the #2d combination of Jack Calvert (12) & Elias McQueary (12) fall in three 1-6, 6-4, 3-6. Adam Pemberton (12) competed exceptionally well against the Panthers #2s, but fell 0-6, 2-6. Many good tidings to come! In the end, this match needed the Trojans to show up with a lot more tenacity on and off court. #1s Adam Pemberton (12) went up 6-1 in the first set before losing steam and fell 6-7(5), 5-7 in the final two sets. Zach Lewis, took the opposite approach after losing the first set, but came out to a 7-6(6) win in the second. Zach found himself down 1-6, fought back, but ultimately came up short 8-10 in a third set tiebreak. Sam Annakin (10) at #3s had a rocky first set, but won 6-3. However, the sophomore only won 2 of his next 12 games falling 0-6, 2-6 in the final two sets. Jack Phelps (12) & Ben Annakin (12) dropped lots and lots of unforced errors, losing 1-6, 2-6 in straight sets. Jack Calvert (12) & Elias McQueary (12) had three set points in the first set before they lost in a tiebreak 6-7 (7). The two quickly lost momentum and fell 2-6 in the second set. Not a great night for the Trojans, but one they will certainly learn from. Elias McQueary (12) & Jack Calvert (12) win 7-5, 6-1 and have quite the turnaround from the previous night. Way to go boys! Jack Phelps (12) & Ben Annakin (12) make the Eagles work for it in three sets, but just couldn’t quite go the distance, falling 2-6, 6-3, 1-6. All three singles fought valiantly, but were just outgunned against the #18 state ranked Guerin singles lineup. Their strength is clearly in their 1-2-3s. In other good news, the boys left with a tray of cupcakes from a (very early) Guerin senior night. Wrong colors, but we’ll take them. Close matches all around against a beefed up Pike Red Devils lineup. #1s singles Adam Pemberton (12) won the first set 6-3, before he saw a freshman ruffle his feathers in the second set. After going up 5-0, Adam had to serve at 5-4. He put three big first serves in a row in going up 40-0 and closed it out 6-4. #2s Sam Annakin (10) played the Pike former #1s and fell in the first set 4-6. Sam turned things around 6-4 in the second, before prevailing 10-8 in the third. #1d Jack Phelps (12) & Jack Calvert (12) took home a 7-6 (7), 6-4 win against a Pike team that pushed the duo to their limits all the way to the end. #2d Jacob Zurawski (11) & Ben Annakin (12) played a very error-prone first set, despite winning 7-5. They got their act together in the second and punished the Red Devils 6-1. The fight song was sung on the bus for the first time this year as the Trojans netted their first road win! For the third time in program history (1995, 2006, 2018), the Trojans knock off the Lawrence North Wildcats! 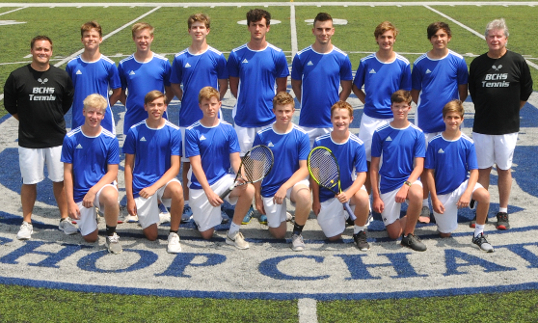 Celebrating a huge team victory, Jack Calvert (12) & Sam Annakin (10) white-balled their #2d opponents 6-3, 6-0. The second point off court was #1d duo of Jack Phelps (12) & Ben Annakin (12). After dropping the first set, they took it home in three, 2-6, 6-3, 6-3. #3s Elias McQueary (12) sealed the victory against LN. Despite losing his first set as well, Elias captured the win by a 3-6, 6-4, 6-3 margin! Way to go Trojans! Jack Phelps (12) & Ben Annakin (12) fall in the closest match of the evening at #1d, 6-7(6), 3-6. Adam Pemberton (12) at #1s competed exceptionally well but fell, 1-6, 0-6. Adam Pemberton (12) competes well against a fellow senior, taking a 6-2, 6-2 dub-ya home. Jack Phelps (12) & Ben Annakin (12) sought the coveted white ball after being up 6-3, 5-0. In the end, the duo won 6-3, 6-3. Zach Lewis (11) moves to #1s, while Sam Annakin (10) takes on #2s and both pick up the win 6-0 6-0. Grant Millman (10) stepped in at #3s, but after going up 6-3, 3-0, a heavy drizzle hit forcing an early decision. Jack Phelps (12) & Ben Annakin (12) win at #1d, while Ethan Pratt (10) & Jacob Zurawski (11) win at #2d. The drive down was f-l-o-o-d-e-d! I still can’t believe we got this match in. Pretty sure we were the only Indy school to get a tennis match in on this evening. 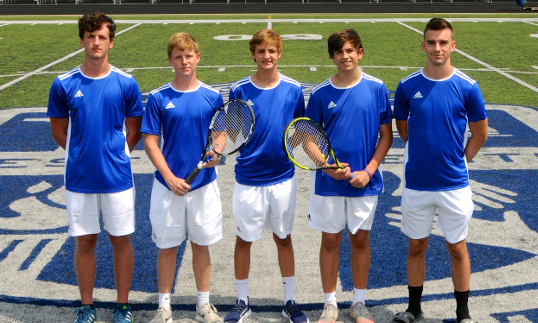 On Senior Night for the Class of 2019, the Trojans picked up a decisive 5-0 victory. The Trojans only lost seven games across all five courts. The lone win for the Trojans was Zach Lewis at #2s with a score of 7-6(3), 6-2. Unfortunately, the Braves straight up lineup is dominant (#10 in State), and will be even better next season (#5 or under in state) as they will have 5+ GOOD seniors. What a massive team effort to capture this 3-2 win! In what was the latest night of my tenure, the Trojans prevailed with wins from Zach Lewis at #2s 6-2, 6-1, #3s Sam Annakin [the clinching took-three-sets point!] 6-2, 1-6, 6-3, and #2d Calvert and McQueary 7-5, 7-6(3). #1d Phelps and B. Annakin fell 3-6, 6-3, 2-6 while #1s Pemberton fell 1-6, 2-6. The depth of this Trojans squad provided a big 3-2 win against a Lebanon squad who is tough to beat on their home courts. Wheewwwi These guys are taking years off the coaches’ lives this season! How many of these 3-2 three set wins can the boys pull off this year?! Wow, this team has heart! #2d Calvert & McQuery were the first point in the bag with a 6-2, 6-3 dub. What followed were dominant performances by the Eagles against #1s Pemberton (falling 1-6, 0-6) & #1d Phelps & B. Annakin (falling 3-6, 0-6). Down 1-2 in the team score, S. Annakin won 11 of his last 14 games to capture a 6-3, 6-2 win at #3s drawing the match score back to even. Last out on court by a good hour was Zach Lewis, who after falling in a back and forth first set 4-6, rallied to win 6-3, 6-1 to round out a stellar night for the Trojans earning the team a 3-2 win against a HC team that whooped up on the Trojans 5-0 last year, what a turnaround! The 3-2 win against the Heritage Christian Eagles brings an end to the City regular season for the boys. All positions will earn a top four seed (seeding meeting pending Wednesday 9/19). The Trojans Boys moved to 9-5 on the season, great teamwork! This match was against a New Pal team who beat Mt. Vernon 3-2 just the night before (BCHS vs. Mt. Vernon was a 0-5 loss). #3s Sam Annakin hit a 6-3, 3-6, 7-5 win. Jack Calvert & Elias McQueary scored a 6-1, 6-3 rout at #2d. This brought the score to 2-2 and it came down to the #1d court. #1d Jack Phelps & Ben Annakin had a 6-0, 4-1 lead and let it collapse away losing 11 of the last 12 games. Bummer. The Trojans won 31 points, a team high dating all the way back to 2001. #2d Jack Calvert & Elias McQueary become the first Trojan City Champions since 2002. #3 seeded Jack Phelps & Ben Annakin avenged a regular season loss to #2 seed Heritage Christian 6-4, 6-4. #3 seeded Sam Annakin avenged a regular season loss to #2 seed Covenant Christian 6-4, 6-0 before falling 2-6, 0-6 to a Wojtalik. #2 seeded Zach Lewis fell in the finals 5-7, 0-6 after he had his opponent so frustrated he was in tears the first set. #4 seeded Adam Pemberton fell on the singles court 0-6, 0-6 to yet another Wojtalik. My oh my! Trojans win, Trojans win! The most thrilling win of the ages for the Trojans, 3-2 over the Rebels! What a night to see this group of players come together and play heart and soul for each other inside a humid UIndy Bubble (of whom we were greeted with very kind & warm hospitality). 1D B.Annakin/J.Phelps claim the swing point 6-2, 6-7(3), 7-6(3). This group combined a 10 win season—the first since 2012! And just like that, the Trojan season comes to an end. An 0-5 loss to #3 North Central Panthers saw the boys combine to win a set (six total games across five courts). What a day and what a season. It all officially ends at 10-7, the most wins by a BCHS boys team since 2013. In a match that saw #3d of Zach Engelman & Sam McCarthy-Young take an early 2-1 decision due to rain, the Trojans didn’t lose a game. 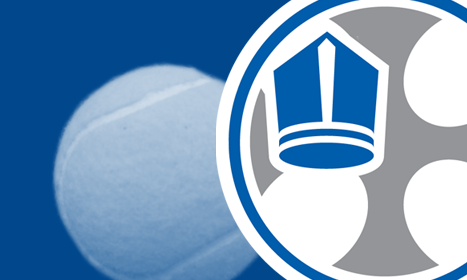 #1d Ethan Pratt (10) & Patrick Felts (11) won 4-0, 4-0 while Grant Millman (10) & James Duncan (10) won 4-0 at #2d. Jacob Zurawski (11) falls 3-8 at #1s while Patrick Felts (11) & Grant Millman (10) fall 5-8 at #1d. In their first complete high school match, Zach Engelman (9) & Sam McCarthy-Young (10) fall 1-8. Jacob Zurawski (11) won at #1s in a fantastic match 4-3(3), 4-1. Grant Millman (10) at #3s also played a highly competitive match winning 1-4, 4-1, 7-6. Zach Engelman (9) loses a close #2s match 7-8 (3) against a senior in his first look at a high school singles match. Jacob Zurawski (11) & Grant Millman (10) take down Alex Porter and a fellow senior on the Eagles, 8-1. What a night for the JV! All four matches went to three sets and did they produce! The Trojans took home three of these matches, winning at #1s Grant Millman (10) 5-3, 3-5, 10-8. Grant made coach a little nervous going up 6-1 in the tie break, before making it 9-8. Great close! At #2 Sam McCarthy-Young (10) got the win 2-4, 4-1, 4-1. #1d James Duncan (10) & Patrick Felts (11) took home a W after dropping a rough 1-4 first set. The two rebounded 5-3 before closing it out 11-9 in the third set. Patrick Felts (11) wins at 2s 6-1, 6-4. Grant Millman (10) & Ethan Pratt (10) win 6-4, 6-4 at 1d. Sam McCarthy-Young (10) & Zach Engelman (9) take home a 6-2, 6-1 win. Grant Millman (10) nets the only win of the night for the Trojans at #2s, 5-4(2), 2-4, 10-6 after some stellar play. Congrats G$$, two years in a row! Patrick Felts (11) wins his #1s match 4-1, 4-0, while Ethan Pratt (10) & Grant Millman (10) win their #1d match 4-0, 4-1. Grant Millman (10) earned a decisive 4-0, 4-1 victory at #1s, while #1d Jacob Zurawski (11) & Ethan Pratt (10) won in the same dominant fashion 4-0, 4-1. The two played back against the Warriors JV #1s and a fellow senior, winning 4-1, 4-0. Grant Millman played his way to a golden match! Grant won 4-0, 4-0 without losing a SINGLE POINT en route to his win, putting him at a team best 10-1! Patrick Felts is the only Trojan to earn a W against the Brebeuf JV, playing a #2s senior and winning 4-2, 4-2. Ethan Pratt and Jacob Zurawski at #1d found themselves in a dog eat dog battle, but eventually fell 5-4(2), 4-5(3), 6-10. Grant Millman with the show court special squeaks out a #1s 9-7 win (even though he was supposed to play a tiebreak at 7-7—but hey we switch up the JV format so often, I don’t blame the kid!). Sam McCarthy-Young took home a 8-1 win at #2s, where Zurawski & Pratt edge Lebanon 8-7(3) at #1d. Doubles duos proved to be the stronger foe tonight against the Eagles, with Zurawski & Pratt winning 6-2 at #1d and Engelman & McCarthy-Young 6-0 at #2d. New Pal brought the whole neighborhood to play with approx. 26 guys. Made for a busy night at JV. Winning courts were #3s Sam McCarthy-Young 6-4, #1d/#2d Millman/Zurawski, #3d Pratt/Felts, & #4d McCarthy-Young/Engelman. Jacob Zurawski faced a heck of a little player at 1s, sending him back to where he came from 8-2! Ethan Pratt wins 8-6 in the last match on of the night at #2s. Zach Engelman also won 8-6 in a late night match at #3s. Patrick Felts & Sam McCarthy-Young win 6-1, 6-1 at #1d/#2d.